So, here’s my take on a deli breakfast for dinner. Swap the bagel with some linguine and the cream cheese for goat cheese and you’ve got all that smoked salmon goodness at a more appropriate hour. This dish only has 5 ingredients, but tastes just right. If you want to lighten up the carbs, add a few handfuls of baby spinach. Either way, it’s another tasty, easy weeknight meal. Bring a large pot of water to a rolling boil. Salt it well, then add the pasta and cook until almost al dente, about 7 minutes. Reserve 1 1/2 cups pasta water, then drain. Resuce the heat to low and put the pasta back in the pot. Add the salmon, capers, black pepper, goat cheese, spinach and pasta water. 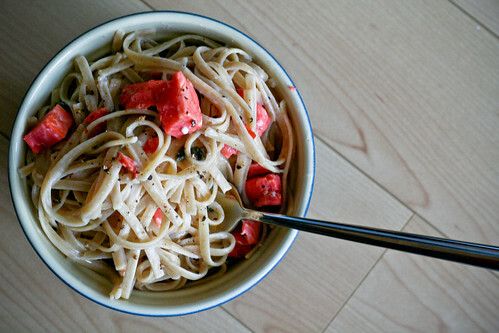 Using 2 spoons or kitchen tongs, toss until the goat cheese turns saucy and coats the pasta evenly. Serve immediately and top with more capers and black pepper (if you’d like). great colors! i bet that is great. Divine! I would love this, but no one else in my family would…GOOD.. more for me! Looks great! Do you use non-pareil capers? Salmon and goat cheese. Love that to death! You had me at ‘goat cheese’…but wow, FAST and EASY, thank you, thank you! Sarah – Nope. Just the regular salt-packed ones from the grocery store. Nonpareils would be great though! Love Thai curry! The addition of the egg sounds great too and I wouldn’t have thought of it. I have a problem finding curry paste though. Where do you get yours? hi there! i love your blog! i made this last night except i substituted spinach with rapini and used buckwheat pasta. it turned out beautifully and really deelish. i used a belly piece of smoked salmon so it was extra fatty and yummy. thank you!